Fancy Linen 3pc Elephant White Purple Pink Yellow Green Sheet Set New (Twin, Sheet Set). 3pc Set Twin Size Sheet Set. 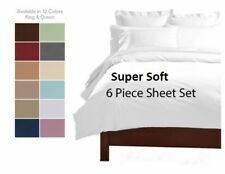 Set includes: 1 flat sheet, 1 fitted sheet and 1 pillow case. Fancy Linen 3pc Sheet Set Giraffe Elephant Monkey Crocodile Green Brown Grey Beige White # Animal Kingdom New (Twin). 3pc Set Twin Size Sheet Set. Set includes: 1 flat sheet, 1 fitted sheet and 1 pillow case. 2 PILLOW CASES ARE CAMO PRINT AS SHOWN AND 2 ARE SOLID PURPLE. THE FITTED SHEET IS CAMO AS SHOWN AND THE FLAT SHEETS IS SOLID PURPLE. PURPLE CAMO SHEETS. 1 FLAT 1 FITTED AND 4 PILLOW CASES. NO COMFORTER. Fancy Collection 4pc Full Size Sheet Set Teens /Girls Peace sign Hearts White Pink Purple New# Peace White. 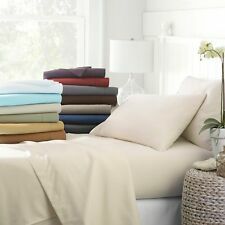 1 pc fitted sheet full size 2 pillow shams. 4 Pc sheet set Full Size. IZOD Sheet Set. quite stunning with an ecru background and red / blue plaid GRID. Made of 100% Polyester - brushed microfiber these sheets are. 1 Queen Fitted Sheet 60"x 80" (152cm x 203cm). 1 Queen Flat Sheet 90" x 102" (229cm x 259cm). 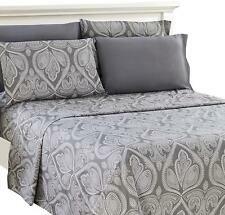 3pc Twin Size Sheet Set Includes: 1 Flat Sheet (66" x 96"), 1 Fitted Sheet (39" x 75") and 1 Pillow Case (20" x 30"). POWDER BLUE CAMO COMFORTER. COMFORTER SIZE IS 86" X 94". 1 FLAT SHEET 1 FITTED SHEET AND 4 PILLOW CASES. WITH SHEET SET. 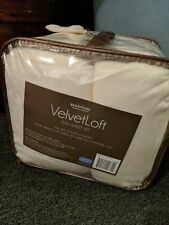 INCLUDES 6 PC SHEET SET. •one pillowcase 20X32. 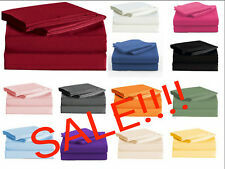 •one fitted sheet 39X80. •one flat sheet 66X101. •machine washable. Brand new and unopened. 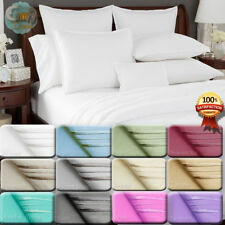 Beautiful queen size shadow stripe sheet set. Includes 1 flat sheet, 1 fitted sheet and 2 pillow cases. The color is ivory or a champagne color. Beautiful! Great gift for someone. Comes from a smoke and pet free home. Seaside Living Sheet Set 4pc King size. 2 king pillowcases 20 x 40 in. 1 Flat Sheet 108 x 102 in. 1 Fitted Sheet 78 x 80 15 in Deep.